Decorative Life: Up to 7-18 days assuming they are treated properly. Van Gorsel (1993) determined that cultivar, season and greenhouse temperature all can influence vaselife. Of these three, season was most important as flowers grown in fall exhibited less vaselife than those grown in the spring. Member of the Rubiaceae (madder) family. Native to Mexico, Central and South America. Common relatives include gardenia, coffee and pentas. Tubular flowers with flared ends occur in loose clusters at stem ends. Stems leafy, 20-24 inches long. Plant is a woody perennial, classed as a dicotyledon, leaves not parallel veined. 45-50 degrees F when stored for three or less days, 50-55 degrees F when stored over three days. When stored dry, the use of a wetting agent uptake solution treatment is recommended either prior to or after storage. Named after Charles Bouvard (1572-1658), physician to Louis XIII and superintendent of the Royal Gardens in Paris. Common florist types are often evergreen derivatives and may not be represented by any of the type species. Hence, a more proper name might be B. spp. 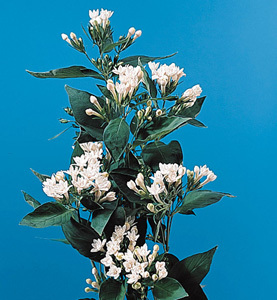 The specific epithet names “longiflora”, “ternifolia” and “leiantha” mean long flowers, leaves in sets of three and smooth-flowered. Flower color and/or whether the flowers are hairy or not determines which species. As with many flower species, it is best to buy and sell by cultivar names so as to determine which ones are best. Besides ornamentals, this family includes a number of important species noted for coffee, quinine, dyes and medicines. Harvest most cultivars when at least two flowers per stem are open. However, some cultivars (especially white flowered ones) should be harvested somewhat tighter. van Meeteren (1990) reported that leaf drooping was mainly due to air in stems. Thus, cutting under water is very important for this species as one way to rid the stems of air. Reid et al. (2001) determined that MCP or STS treatments resulted in more flowers opening per stem and each flower lasting longer.